In 2007, I Lauro Milan, owner of the design and construction company Marrakech 3000 sarl, make the acquaintance of Marco Cisini, the general manager of Hotelplan Italia. From that meeting and the friendship that followed came the idea for Riad Nashira. 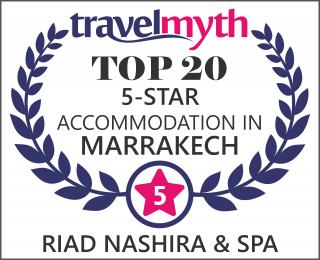 The aim was to build a highly prestigious hotel in the old town, the ‘Medina’, of Marrakech that would meet the increasingly sophisticated needs of modern tourism while respecting local traditions and customs. Reciprocal esteem and shared purpose were the driving forces that enabled our “little dream” to be turned into reality in the best possible way: the mutual expertise in the fields of tourism and construction created a powerful synergy within our company that enabled us to proceed swiftly and calmly with the work. Special attention was paid to the installation of the technical equipment: in this area, attempts were made to minimise the environmental impact of the structure and keep consumption low while always keeping an eye on comfort and safety.Solar panels have been installed along with state of the art systems areas. In place of gas, due to the danger it presents in enclosed spaces, petrol was chosen, which also solved the problem of resupply. Almost all the furnishings were made by local craftsman. In fact, most of the items were made exclusively for the Riad. It should be remembered that in no other city of the world can such a concentration of craftsmanship be found as exists in Marrakech. The souq is an open-air shop window where inspiration can be sought for handmade textiles or cloth imported from the east, iron lamps and shades in various metals, candles, ceramics, inlaid and decorated tables, mirrors framed in precious wood embellished with ebony or stone inlay, leather goods, an infinite variety of carpets and much, much more. In the city and the industrial zone, there are also artists, painters and craftsmen selling their works, Moroccan by inspiration but reworked in a modern style. The Riad Nashira opened its doors in April, 2012; after so much hard work, it was a very exciting moment as all the ideas and designs came together in concrete form as we had imagined. At this point, however, another challenge awaited us, different from the previous one but complementary: management, that is, being able to offer clients a unique experience that meets their expectations with a complete, exemplary service. In brief, to see the place well occupied and our dreams fulfilled.We can say that we are satisfied and that we look to the future with optimism, well aware that the challenge and commitment must be there every day.